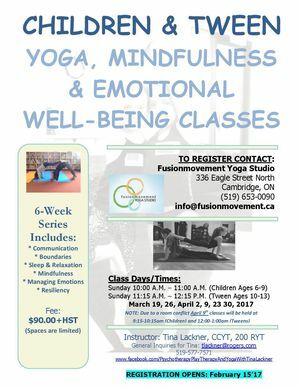 Children/Tweens are introduced to a variety of yoga postures in a fun, age appropriate and meaningful way that will assist in understanding more about their body, breathe and emotional well being. This is an engaging class where children/tweens are encouraged to become aware of their thought processes, body image, coping mechanisms and emotional reactions. Children/Tweens are supported in learning new concepts in mindfulness, emotional well being and healthy life style alternatives and each class will end with an opportunity for relaxation and reflection. This page contains a single entry by Settlers Grove Admin published on February 16, 2017 1:43 PM. Family Skating Party was the previous entry in this blog. 2017 Easter Egg Hunt is the next entry in this blog.